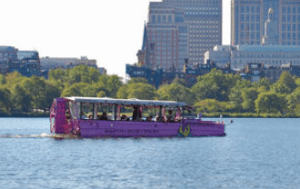 Boston Duck Tour Discount Tickets for the 2016 Season! This post is getting old. Here are the 2017 Boston Duck Tour Discounts and Deals in Boston! Enjoy! The Boston Duck Tours are back for the 2016 season and LivingSocial has released a daily deal to compliment the Boston Duck Tour season opening! If you are looking to take Boston Duck Boat tour, regular price admission is $37.50 for adults, $31 for students 12+, seniors 62+ and military members, $26.50 for children 3-11, and $10.50 for children under 3. However, you can grab discount tickets for the Boston Duck Tours through LivingSocial for $25.99 a person which is a 30% savings. Keep in mind the daily deal isn’t valid on Saturdays and the promotional value is only valid for 120 after purchase. The LivingSocial Boston Duck Tour deal is for the 80-minute duck boat tour from the Museum of Science location only. For more information about the LivingSocial duck tour daily deal and all the terms and conditions, please head here. Also, Goldstar Boston is back with discount tickets for the Boston Duck Tours and you can get tickets directly through Goldstar for $26.25 (+fees) for select dates (and more dates tend to get added throughout the season too) if you are looking for another duck tour deal! If you are visiting Boston on vacation soon, you may want to check out the Go Boston Card because duck tour tickets are included in select packages as well. Have you taken a Boston Duck Tour before? Will you be taking one this year?